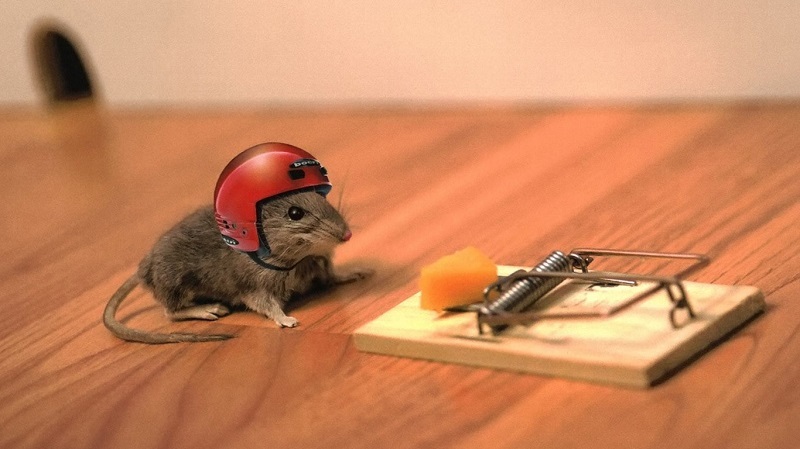 But – is it really fraud they’re objecting to or that they’re finding themselves caught in their own trap? On Friday, the NFL, in a couple of caustic motions, decried massive fraud on the part of players, lawyers and doctors in the NFL concussion settlement, while failing to acknowledge that this is a climate of their own making. For decades the NFL has covered up, misled and concealed the dangers and risks of brain injuries to its players and throughout this time vigorously opposed almost all disability claims filed against the league regarding both physical and neurological impairment. It has recruited doctors willing to “fail” players by one or two points on a subjective scale and only through congressional scrutiny finally agreed to recognize the findings of the Social Security Administration as to a player’s degree of incapacity. In recent years it has tried to backtrack on the agreement, adding additional requirements and legalistic loopholes which have nothing to do with a player’s medical condition to circumvent claims. Sometimes it takes a decade of court battles in order to procure benefits from the NFL. The NFL is crying fraud once again. Both legitimate and questionable claims are being caught up in the NFL’s audit blitzkrieg and once again on a massive scale, retired players are being painted as liars and frauds in attempt to protect the league’s bottom line and perhaps also to avoid admitting how widespread football induced brain damage truly is. The NFL recognizes this as an existential threat to both its continuance and bottom line so their reactions are totally expected. Unfortunately, retired players, already familiar with the “company line” are caught up in a no-win situation. 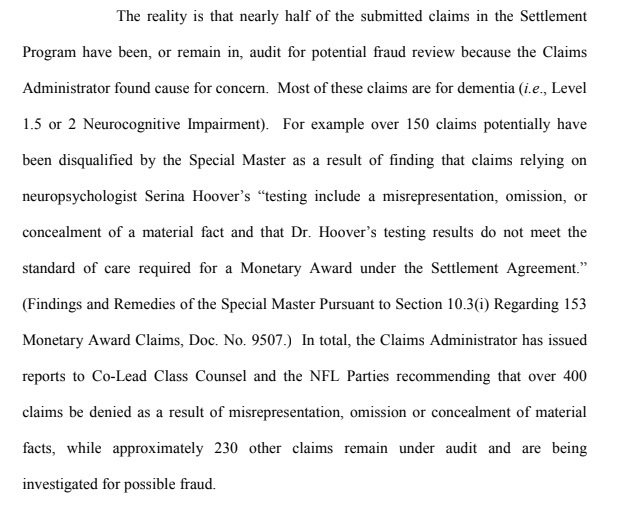 Attorney Brad Karp, representing the NFL writes in a response objecting to a change in settlement administration, “The pervasive fraud by doctors, lawyers and certain players cannot be allowed to continue,” and files a separate motion requesting a special fraud investigator to in order to further scrutinize and intimidate players, doctors, and lawyers alike. He attempts to herald the disastrous settlement as a success and paints players, doctors, and lawyers who are trying to see legitimate claims processed in a fair and efficient manner as fraudsters, lumping them with the minority of improper claims. Much of mainstream media have picked up on the filings of the NFL and portray the allegations as fact without diving into the background involved. The second part of this two-part series will examine Chris Seeger’s acidic response to the Locks motion. The remainder of part-one will focus on the NFL. While this is typical opening statement for the NFL, which tends to focus intently on rhetoric and loopholes in the legal system, the Locks motion is grounded in many truths that the NFL refuses to acknowledge. A major takeaway, however, from the opening of Mr. Karp’s statement is his agreement with Co-Lead Class Counsel’s Opposition, which at the time of his filing had not been filed and only appeared on the court docket several hours later. This can only mean that both Seeger and NFL counsel worked together in preparation of their opposition briefs to the detriment of the retired NFL players. Far from an uncontemplated position as the NFL alleges, it would stand to reason that this move was long contemplated by the Locks Firm after numerous attempts to address problems in a less public manner failed. As I detailed in a previous article, a motion of this type is quite unusual in that Class Counsel rarely voice a public position of opposition to Lead Counsel because it can be a costly endeavor regarding future work. The NFL cites the same misleading figures that Seeger has used that would tend to support their position of success. Omitted from the general numbers is the reason that claims approvals have exceeded first-year dollar figures. This is because the class of retired NFL players is sicker, at younger ages than the faulty actuaries the settlement was based on would indicate. Both ALS and Death with CTE cases which are not easily disputed have already exceeded projections for the entire 65-year span of the Settlement. The majority of claims that have been paid, along with those for Parkinson’s disease, fit into this category and are not reflective of the vastly larger population that has been diagnosed with Alzheimer’s and dementia. Players with those diagnoses are being mercilessly questioned regarding the legitimacy of their conditions and put through a torturous process of having to endure allegations of fraud before most of their claims are even considered. The delays, mass audits and denials point to a very real effort to obstruct claims in the Settlement. If the NFL denies responsibility for this, then who else might be responsible? The NFL denies the reality of obstruction just as it has in the past vehemently denied the relationship between football and brain damage. Obstruction and deceit appear to be ingrained in “the NFL’s DNA,” to borrow a phrase from the Locks motion. Another point to glean from the excerpt above is that the NFL’s definition of “legitimate claims,” would greatly differ from that of a treating physician or otherwise informed party. The NFL’s definition of legitimate appears to be even narrower than the stringent requirements of the Baseline Assessment Program (BAP) and would be more akin to requiring an equivalent of potted plant to show neurocognitive impairment, which certainly isn’t the reality of the covered conditions in most instances. Instead, Alzheimer’s and dementia patients experience a slow and gradual decline in varied areas including memory and an ever diminishing but generally not sudden loss of other life skills. The NFL states that, “The NFL Parties also have appealed only 10% of payable claims decided as of April 9, 2018,” but this is only after successfully deploying the processes used by the Claims Administrator in delaying and red-flagging the majority of claims. The NFL should not be appealing any claims that somehow made it though the intense scrutiny that claims are subjected to. The figures cited, and claims made by the NFL seem startling until one reads between the lines. First, the “independent” claims administrator is not truly independent but rather reliant on the instruction of NFL Counsel and Chris Seeger as Co-Lead Class Counsel for direction as to how they wish the terms of the Settlement interpreted. It would seem that Claims Administrator BrownGreer is exceedingly vigilant if not overly aggressive in seeking to weed out fraud. Advocacy for Fairness in Sports is aware of numerous players that a reasonable person would agree are impaired but looked upon with skepticism in the Settlement because of minor omissions which in many cases were not outlined as required in the agreement the court signed off on or video “evidence” which has been found of the player appearing functional (sometimes video that is several years old). A guilty until proven innocent mindset appears to drive claims evaluations, and the search for video evidence that can be used against a claim seems pervasive. The wife of a well-known player stricken with ALS related her experience with the claims admin in this regard. “We’ve googled video of your husband and don’t doubt that he has ALS, but your paperwork isn’t quite right.” An obviously legitimate claim was denied much needed relief for over a year because the claims administrator apparently thought he was more qualified than this player’s physicians as to how his medical notes should read! Claims of those with less visible impairments are seemingly held hostage if there is any internet reference to some semblance of functionality. In the interest of fairness, it should be acknowledged that whenever money is involved there will be some degree of fraud. NFL players differ little from the general population in this respect, but there is no credible evidence to support that they are more deceptive than the average person. In many cases what appears to be deception is driven by a combination of two factors, brain damage and fear. The NFL has a long history of denying legitimate disability claims; in fact the problem was so pervasive that congress had to eventually intervene and the NFL was backed into the corner of accepting the ruling of a Social Security Administrative Judge as adequate evidence of disability. Players who try to receive compensation under the NFL’s Plan prior to or in lieu of applying for Social Security Disability continue to face the everchanging roadblocks to impede their claims. Many of these men are settlement class members in desperate circumstances and find themselves vulnerable to those who promise approvals through unsavory means, and this includes some law firms who at least initially saw the players’ claims as easy money. The NFL’s own intimidation and creation of an intense climate of fear in the retired NFL community is responsible for driving legitimately ill players to parties that will tell them what they want to hear in hopes of overcoming the NFL’s road blocks, only to find themselves sacked once again. If not for the NFL’s own actions against its retirees, fraud prevention would be a relatively simple and much less time-consuming matter. The assertions made in the Locks motion are correct. I have written extensively on this subject since August of last year and am personally aware of severely impaired men who have been improperly denied because their long-standing medical diagnoses and supporting records don’t comport to the language the NFL requires as proof of severe impairment. The NFL twists the words and context of the Locks motion. While Locks chose to identify processes unfavorable to the retired players and dared to allege that Mr. Seeger has not been effective in looking after their interests, both the personal attacks against Locks and other attorneys in this motion and the one filed by Seeger are more unbecoming to those hurling them, than to those targeted by the attacks. 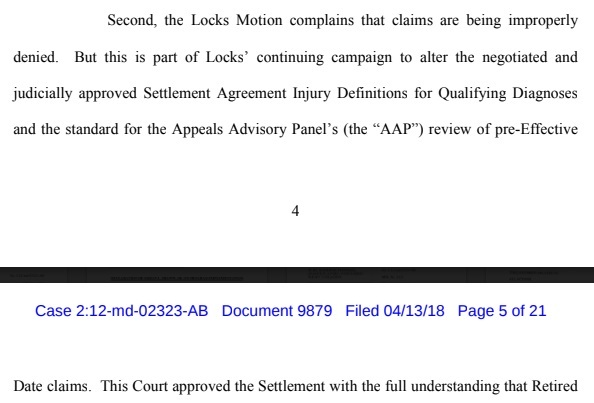 Locks asserted that that AAP physicians are being provided a manual to instruct them in claims evaluation and rightly complained that this manual is not available to his firm despite its appointment as Class Counsel and on information and belief available to no one outside the NFL, Seeger Weiss, the Claims Administrator and the doctors to whom it has been issued. This is a legitimate concern. The excerpt above is perhaps the most laughable statement in the entire brief. The league’s version of integrity can be defined in many ways, but typically not in a way aligned with any moral conception of the word. Instead, integrity NFL style tends to comport with a secondary definition which would resemble an immovable and impenetrable fortress of protection of its interests regardless, and often devoid of any ethical considerations. The NFL admits that nearly half of submitted claims have been subjected to audit. An insurance company that handled claims in this manner would quickly be out of business because no consumer would willingly do business with a company that actively sought to discredit their claims. Instead insurance companies have practices in place that quickly flag questionable claims and pay the remainder in a reasonable time frame. 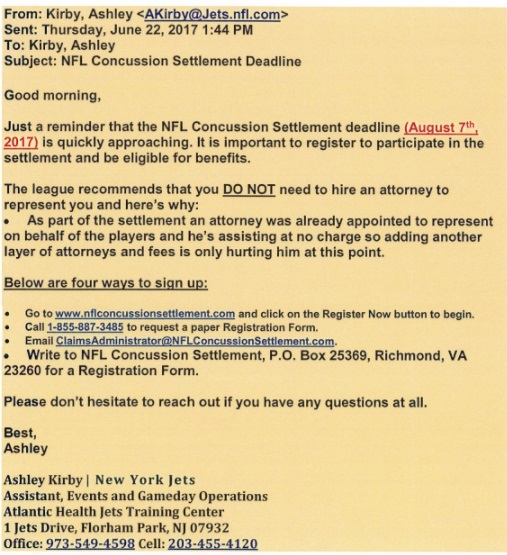 The Claims Administrator is doing much of the heavy lifting for the NFL in the Concussion Settlement. While the claims admin is portrayed as “independent” they merely implement the instruction of Seeger and the NFL. Notice the Claims Administrator has recommended “over 400 claims be denied as a result of misrepresentation, omission or concealment of material facts.” Notice that medical reasons were not among the criteria mentioned. 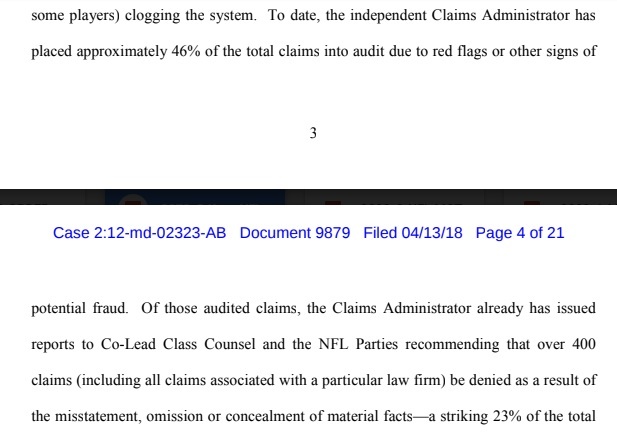 The Claims Administrator, has done the NFL’s bidding extremely well in that they place all claims in preliminary review and find them deficient if all of the paper work and medical records they have identified during the implementation phase of the settlement, but not identified in the settlement agreement are missing. Failure to provide documents that may not exist can result in audit on grounds of omission. A player can be accused of misrepresentation or concealment if he fails to submit medical records of substance abuse, psychological treatment or sleep apnea. If he submits these records they can be used to deny his claim which is expressly against the terms of the settlement which seem in large part moot to the parties who oversee the claims. Other players are red-flagged if they happen to have a job of any kind which would apparently negate the well-known and accepted diagnosis of early onset dementia in basketball coaching legend Pat Summitt and Alzheimer’s disease in former President Ronald Reagan in the eyes of the Settlement. In a must-see documentary, Requiem for a Running Back, Rebecca Carpenter takes the viewer along in her search for closure regarding the decline of her father Lew Carpenter, and his posthumous diagnosis of CTE. Like many sufferers of CTE and the more readily diagnosed conditions of Alzheimer’s and dementia, Rebecca recalls how her father compensated as long as he could as he tried to hold his coaching position with the Packers and maintain a grip on life. This is the typical scenario with latent brain injury diseases. Seldom does a victim of these conditions immediately become 100% non-functional 100% of the time, but this seems to be an unwritten requirement for compensation as far as the NFL is concerned. Instead of accusing Mr. Locks of misleading labels, the NFL should recognize that the problems it outlines in their brief are of their own creation. Jointly with Mr. Seeger, the NFL discouraged players from seeking legal counsel in regard to their claims. They widely proclaimed the $112.5 million to be awarded as payment to Class Counsel knowing full well that brain damaged players and even some unimpaired wives would be unable to distinguish between duties performed on behalf of the class and duties performed individually on behalf of clients. Seeger, who has very few personal clients and who also stands to receive the bulk of the common fund very publicly voided his contingency fees for the players he represented. This created an environment which made it easy for players to resent their lawyers and for unscrupulous lawyers to poach clients from the legitimate law firms who initiated the brain injury lawsuits and were increasingly painted as an enemy to the Class. Impaired players were manipulated into believing that their lawyers were double dipping and fired them only to be snared by those who promised them low fees and guaranteed approvals. It cannot be emphasized strongly enough that many of those who are painted as trying to cheat the system have legitimate illnesses, and coupled with the conditions described above and a general mistrust of the NFL it is easy to see how they could believe they needed extra assurances that their claims would prevail. 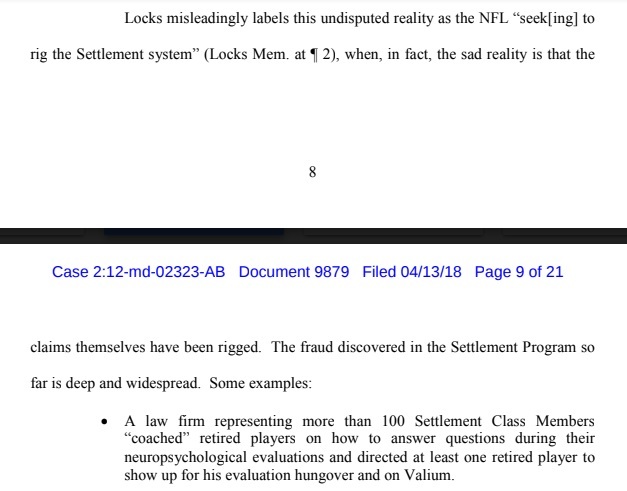 The Court recognizes this regarding predatory lenders but fails to see how brain-damaged players were also manipulated and set up for failure by both the NFL and Mr. Seeger. This point seems much more nefarious than the actuality in many instances. Since the NFL refuses to provide health insurance to its players past the 5th year of retirement, many Class Members are uninsured. As stated by NFLPA Executive Director DeMaurice Smith, “We have a 100 percent injury rate in the National Football League. And so every player leaves the National Football League with a preexisting condition.” These preexisting conditions create prohibitive insurance rates which are not affordable for many. One wife I spoke with told me that her husband’s monthly premium is $1,500. That figure exceeds the monthly income for many debilitated players and is also beyond the scope that lawyers can cover. Players in this position often have no way to cover the cost of care until their claims are approved. The NFL is especially adversarial to claims of impaired younger players. If a condition presents at an earlier age than prevalent in the general population, the player is automatically labeled as a liar. While I can’t offer comment on this specific case, I’ve seen similar attacks on other impaired players, simply because their diagnosis is not characteristic of the general, unaffected population. As noted previously in references to Pat Summitt, President Reagan, Lew Carpenter, and Glen Campbell, long-term memory is not typically affected immediately, and therefore many guys struggle to do what they can do for as long as they can. They write notes to themselves and often have assistance in hanging on for as long as possible. NFL players are typically of above average and often exceptional intelligence. Scientific studies have shown that the brain often re-routes neural pathways when the typical pathways are damaged, especially in the instance of gifted people. The accounts for presence of functionality that the NFL tries to discredit as fraud. The mere existence of evidence that a player may, relying on long-term memory, speak coherently is not evidence of fraud if a clinical diagnosis of damage exists. I’ve had many seemingly coherent conversations with players that I had to repeat to their wives because they couldn’t recall what I said. Eventually as in cases of CTE, and the manifestations of dementia and Alzheimer’s, the brain becomes too damaged to compensate, but this is in the latter stages of the disease, which the NFL does not wish to acknowledge. The NFL again contorts the facts. Prior to the effective date of the settlement attorneys had the option to contract with physicians for examinations with their clients if the NFL approved use of these physicians. As noted previously, this is standard practice facilitated by the necessity of streamlining the billing process and perhaps obtaining a discount for services which is helpful to both players and attorneys. On information and belief, the NFL now endorses audit of a physician they approved for this purpose. As the settlement stands no party in a decision-making role is vested in the outcome for players, and as such the Locks Firm is highly invested and this is the reason their motion should be considered by the Court. Wrong again! If these terms were in fact “clear” dozens of attorneys would not be objecting to de facto changes to the settlement to the detriment of the players. If the criteria the NFL clings to was “clear” in the settlement, law firms, lenders, and so-called claims services would not have jockeyed to enlist sick NFL players as clients. The only thing about the settlement that is “clear” is the NFL’s direct and indirect war against claims. Locks is one of many lawyers who have pointed out since August of last year that the “generally consistent” definition is being contorted and used against players in direct conflict to the manner in which the Settlement was sold and presented. This is not the Settlement agreed to since many older diagnoses do not comport to the rigid standards the Parties now wish to impose. As pointed out by Locks and many others, this is in fact an amendment without notice to the Class, a change of review standards, and an apparent scheme to defraud players of what they were led to believe were qualifying diagnoses. While touched upon before, the Locks motion attacks no one in particular but it does state concern that AAP doctors have been wrongfully manipulated by the NFL and perhaps Mr. Seeger through documentation and instruction no other lawyer has access to. The NFL motion continues to paint Mr. Locks concerns regarding the AAP as attacks, when his concerns are very legitimate. The NFL has been found guilty in a court of law of manipulating and even paying doctors to render an unfavorable diagnosis in a disability claim. Why should Locks or any other attorney step aside and give the NFL carte blanche to do the same in the settlement? In summary, the problems the NFL now decries are a result of its own self-serving behavior. It has become an expert in the marketing of fraud, and now is objecting that the chickens may be coming home to roost. Since examples given in the NFL’s brief are for the most part vague, I cannot dispute some of their claims directly but I believe there is ample room for reasonable doubt. The league made its bed years ago and should now be forced to lie in it.